Free things to Do in Gatlinburg Both Kids and Adults Will Love. Gatlinburg gives you easy access to the Great Smoky Mountains National Park, where you&apos;ll find over 800 miles of gorgeous maintained hiking trails. Traveling with little children? Try easy local trails such as Sugarlands Valley Nature Trail. Mostly flat, paved, and stroller-accessible, this half-mile, self-guided trail winds through picturesque woods to a crystal-clear stream, then back to the parking area. Up for a little more challenge? Try the trek to Clingmans Dome, open year &apos;round except December 1-March 31. From Newfound Gap Road, drive the 7-mile Clingmans Dome Road to the trailhead parking lot. Then hike the paved half-mile trail to the summit, the highest point in the National Park (6,643 feet). 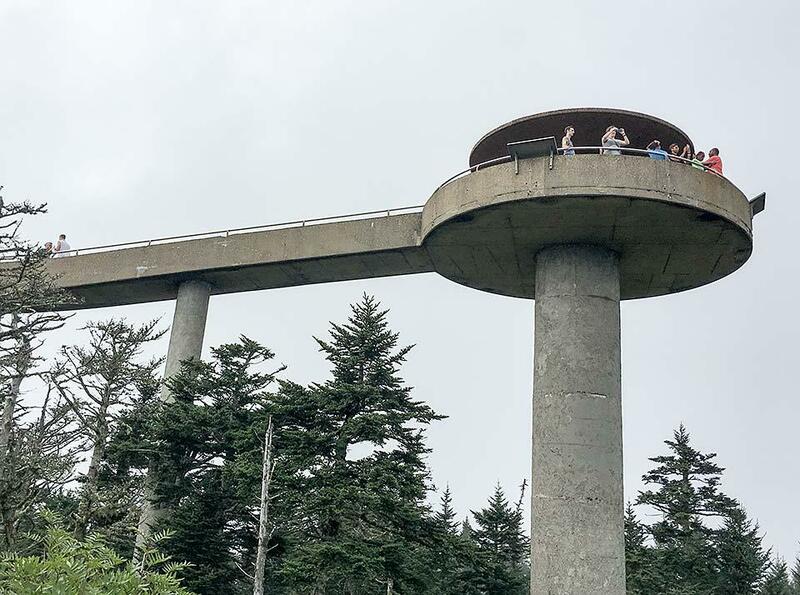 At the top, climb the Clingmans Dome Observation Tower for the experience of a lifetime. The trail is too steep for strollers or wheelchairs, but for older kids and adults, the rewards are more than worth it – sweeping 360-degree views of the Great Smoky Mountains and beyond. On clear days you can see for over 100 miles! Several other trails also start from the Clingmans Dome trailhead. And the legendary Appalachian Trail crosses it at one point. Picnicking&apos;s not totally free; you do have to purchase the fixin&apos;s! But let&apos;s face it, food costs much less at the supermarket than at a pricey restaurant. So, pack your basket, load your cooler, gather the kids, and head to a Gatlinburg public park. At Herbert Holt Park, just off the parkway, you&apos;ll find a kids&apos; fishing stream, a picturesque fishing pier (fully handicap-accessible), a playground area, horseshoe pits, scenic walking trails, and even a fascinating trout-rearing facility. At Mynatt Park on Asbury Lane, you and your kids can shoot hoops at the basketball court, field a few balls on the baseball diamond, play tennis, fish in the kid-friendly stream, romp in the playground, and more. And at Mills Park (Mills Park Road just off Highway 321), you can build up an appetite on the football field, softball field, and basketball court; test your skills at the 9-hole Disc Golf course; sprint down a 400-meter track; play horseshoes; and jog a beautiful jogging trail. All parks provide picnic tables and charcoal grills, so you can cook up a scrumptious feast in the pure, clear mountain air, surrounded by gorgeous scenery. While city parks do charge for the use of pavilions, everything else is free. And, of course, you can also venture outside city limits for even more picnicking options. The nearby Great Smoky Mountains National Park offers plenty of beautiful picnic sites, including several near spectacular waterfalls. Are your kids bouncing off the walls? Let them work off some of that excess energy with a walk through downtown Gatlinburg. The picturesque Downtown Parkway runs from one end of town to the other. Along the way, you&apos;ll pass famous attractions, bustling shops, and popular eateries... not to mention eye-popping scenery. Prefer a slightly quieter stroll? Try Gatlinburg&apos;s fabled River Walk along the banks of the Little Pigeon River. Feel the fresh mountain breeze, listen to the river&apos;s soothing song, and soak up the natural beauty. Even the most energetic kids will find the walk calming and renewing. Twice a year – during summer and winter – downtown Gatlinburg hosts Smoky Mountain Tunes & Tales, a free street performance festival featuring musicians, storytellers, and cloggers, many decked out in authentic 19th-century costumes. Running from right after Thanksgiving to just before Christmas, the winter event holds special appeal for kids. While strolling players fill the air with beloved Christmas carols, classic country favorites, and Appalachian bluegrass tunes, children can mingle with Santa&apos;s elves and hobnob with Frosty and Rudolph – all in a festive, magical setting, amid millions of sparkling Christmas lights. Do your kids enjoy country drives? They&apos;ll love the Roaring Fork Motor Trail, turn at traffic light 8 in downtown Gatlinburg. This 5.5-mile, one-way loop road winds through spectacular woodlands, with views of rushing streams, towering old-growth forest, and historic pioneer cabins. If your family&apos;s up for it, stop along the way to hike up to Rainbow Falls, a moderate 5.4-mile roundtrip trek. As you&apos;re walking or driving around Gatlinburg, challenge each family member to take photos of their favorite sights, sounds, and experiences (with a camera or your phone). Near the end of your trip, go through all the pictures and choose a winner. That person gets to decide where you&apos;ll eat dinner on your last night in the Smokies. So, pack up your bags, gather the family, and head for the Tennessee Smokies.